There are a lot of planetarium software packages on the market and these have a whole host of functions to enable the astronomer to learn his way around the sky, get to know constellations, where to find planets etc., at any given date and time of the year at any location on the earth’s surface. With the onset of GoTo systems, they even link up to the telescope so that with the click of a mouse, the telescope will slew to the selected object. However, I have found that, even though the data that is displayed is incredibly accurate, when you look at the computer screen and then look up at the sky, the difference between the graphical representation of the stars and the real twinkling in the sky is immediately apparent. Well, not any more. 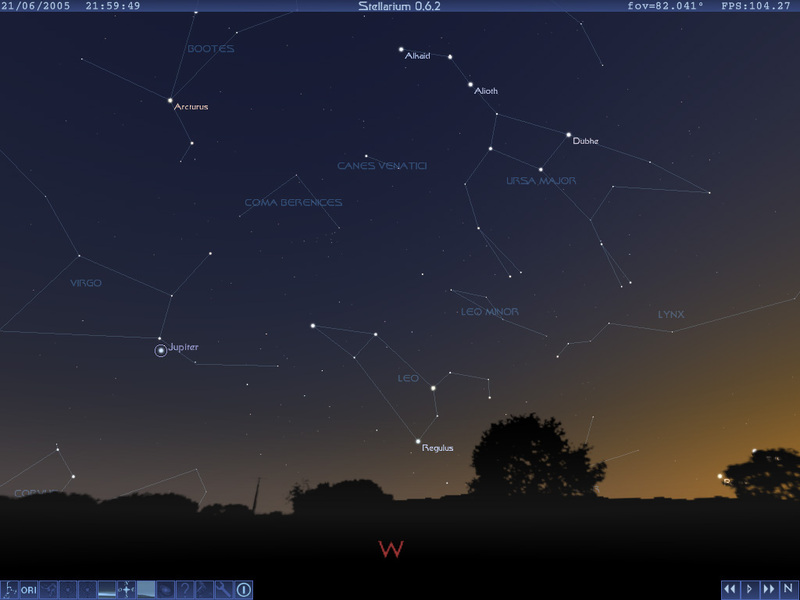 Stellarium is a program I found on the internet that is very easy and basic, yet very real and as such puts some planetarium software into the shade. To download the program go to http://stellarium.sourceforge.net/ and follow the online instructions. Firstly a word of warning for those using dial-up internet connections. The program is about 9.5mb and so could take sometime to download. However, the wait is more than worth it!!! The downloaded file is an executable one (not zipped) and can be used over and over again for installing the software. When the program is loading, it will automatically detect what your video settings are on your computer and set the display accordingly. Once the program is installed you are ready to go. First and foremost is the input of your location. You can do this either by pointing to a location on a small atlas that is displayed or alternatively entering your latitude and longitude manually. Once you have input the parameters, you can set what level of detail you want the program to display. And this is where the software wins. I said that the program is a photo-realistic one. Well, if you are using the program in the day, what you see is a photographed countryside horizon. Above it you will see the blue sky and the sun in the correct direction for that time. So if you look at the south horizon on the program at midday, the sun will be directly in the south. By using the right and left arrows on the keyboard will move your view through the other compass points. As the time moves on (there is a small clock in the top left of the screen getting it’s time from the computer clock) the sun slowly tracks over the sky as it does in real life. As it gets nearer the western horizon, the sky colour changes very gradually through to twilight and then full darkness. As the sky goes through the darkening of twilight, the first of the really bright stars start to show and as darkness draws on, more stars become visible until the night sky is shown on the screen, very much as it appears in real life. If you are using the program at night then it shows the sky as it is at that point in time, and likewise at twilight. Drawing of Constellations – this draws the constellation lines between the stars. Pressing ‘C’ will toggle between displaying them and not. Names of Constellations – this displays the constellation names. Pressing ‘V’ will toggle. Constellations Art - I like this. It shows artistic pictures of the constellations and the mythical figures and shows how each star in the constellation fits into the figure. Pressing ‘R’ will toggle. Azimuthal Grid – This displays the Declination lines on the sky. Pressing ‘Z’ will toggle the display. Equatorial Grid – This display the equatorial grid on the sky. Pressing ‘E’ will toggle the display. Ground – This removes the photo of the horizon. Pressing ‘G’ will toggle. Cardinal Points – This shows the N, S, E, W, points on the horizon so you know which way your display is looking. Press ‘Q’ to toggle. Atmosphere – This simulates an atmosphere. If you have set a time during the day the sky will be bright, but will fade to darkness with the stars coming out if the time is changed to night. Just like the real sky! This control toggles the feature on and off. On the bottom right of the screen are three buttons that can increase the speed of the view and also reverse the movement of the display. One of the little things that makes this photo-realism software just that little bit more real is that in the configuration window, you can even change the amount of twinkling of the stars – a nice touch! To find out about various objects displayed on the screen you can move a set of cross hairs over an object and click on it. In the top left corner is then displayed the basic information about the object – the name, the Hipparchus catalogue number, the RA and Dec and the magnitude. If you click on a Messier object it shows the M number (the NGC number) the RA, the Dec and the magnitude. Unfortunately it doesn’t say what it is (cluster, nebula, galaxy etc). This software is a must for the learner astronomer. It provides a very real display of the sky and allows you to practice star hopping during the day for that nights observing. Are there any downsides? It would be nice to have a bit more information about the Messier objects when you click on them. There is no interface between the program and the collection of GoTo systems on the market. I don’t think this is a drawback as it allows the astronomer to use the best visual aids he or she has, namely their eyes. It allows them to put names to what they are looking at while, at the same time, giving them the pleasure of just enjoying what they are looking at. I would highly recommend this program for downloading and using. DDAS member Chris Newsome is a regular contributor of astrophotographs to this website. Many examples of his work may be found in our gallery.